The neuroscience makes an important distinction between emotional empathy and cognitive empathy (Shamay-Tsoory,2011). Emotional empathy refers at an immediate emotional sharing, while cognitive empathy refers to a cognitive system that involve understanding of the other’s perspective. Saxe and colleagues (2005) show the role of right temporo-parietal junction (rTPJ) in the perspective taking when our point of view is different from other, establishing an incongruence about the different states of mind. Other studies demonstrate that TPJ allows to elaborate and to integrate sensorimotor and cognitive information from self and other. This study investigates the role of rTPJ in emotional empathy, through its inhibition by a train of Trancranial Magnetic Stimulation (TMS), demonstrating a major skill to discriminate an emotional expression of other when this is incongruous with own emotional state. This brain area would function to establishing a border between self and other allowing an integrating emotional elaboration about the different emotions. These results show the importance of TPJ not only in a cognitive perspective taking task but also in an emotional task. Empathy is the main social function that allows us to receive important information about other people in terms of mental state, emotion, sensation and thought. Neuroimaging, lesion and behavioural studies support a model of two separate system for empathy: an emotional system and a cognitive system. The capacity of sharing and recognition an other’s emotion has been described as emotional empathy (Shamay-Tsoory,2011). 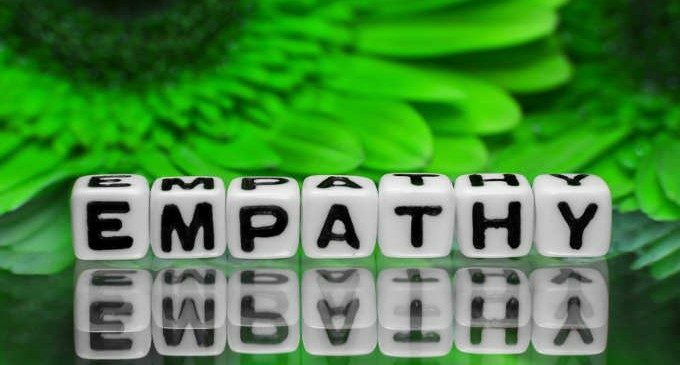 The term cognitive empathy refers empathy as a cognitive role-taking ability, or the capacity to engage in the cognitive process of adopting another’s psychological point of view (Frith and Singer 2008). This system allows to make inferences about other’s affective and cognitive mental states (Shamay-Tsoory and other 2009). These two system are philogenetically different. It was reported emotional contagion in rodents (Langford et al.,2006), while chimpanzees, possess rudimentary traits of cognitive aspect of empathy such as theory of mind (Call and Tomasello 2008). The distinction between the two system may also related to different neurochemichal systems. In a recent study, intranasal administration of the neuropeptide oxytocin increase emotional, but not cognitive, empathy (Hurlemann and others 2010). On the other hand, it has been recently suggested that dopaminergic functioning is associated with cognitive aspects of empathy in preschool students (Lachner and other 2010). An important study with patients confirm the hypothesis of two separate system for empathy through a double dissociation. Patients with Ventromedial prefrontal cortex (VMPFC) damaged show consistent and selective deficit in cognitive empathy and Theory of Mind (ToM), while presenting with intact emotion recognition and emotional empathy. Patients with inferior frontal gyrus (IFG) lesions, on the other hand, displayed extremely impaired emotional empathy and emotion recognition (Shamay-Tsoory,2009). This two brain area are respectively involve in both system but not only these. Recent studies about mirror neuron, localized in Inferior frontal gyrus (IFG; Brodmann’s Area [BA] 45/44/6 ) and in inferior parietal lobe (IPL; BA 39,40) mainly in right hemisphere, have given evidences about immediate sharing of experience between two or more individuals, through an innate function which allows to simulate on own neural circuit the observed action and to understand it without complex cognitive process (Rizzolatti 1996, Gallese et al., 1998, Rizzolatti and Craighero, 2004). In particular, the mirror neuron system (MNS) encodes the aim of the action and for this reason they are activated when the observed action is contained in own behavioural repertory (Rizzolatti and Sinigaglia, 2006; Keysers and Gazzola, 2006). So, an emotion expresses from a face, from body posture or from a movement dynamic, could be considers a communicative action about emotional state [Preston and deWall,2002]. This “emotional action” is encodes through the mirror neurons and the simulated motor information is sent at limb system (specialized in emotional response) through insula that makes feel the same emotion observed (Iacoboni,2008). This process would be the neural base of the simulation theory (Gallese, 2007). The perception of a behaviour in another automatically activates one’s own representation for the behavior and output from this shared representation automatically proceeds to motor areas of the brain where responses are prepared and executed (Preston and de Waal’s, 2002). This process is reasonable related with emotional contagion because understanding of another’s emotion makes feel the same emotion. In fact the overt facial mimicry (as measured by an electromyography or through observation) is related to emotional contagion and emotion understanding (Niedenthal,2007). In human, neuron mirror are situated manly in the IFG, in fact there are many studies which show the correlation between emotional contagion and role of IFG. A mature empathic experience needs to a higher level of consciousness and of a good mentalizing that allows to discriminate self and other experience. In contagion experience the subject hasn’t the consciousness that his emotional state comes from other subject. (Bonino, 1998). This distinction allow to act an altruistic behaviour directs to other emotional regulation because the subject understands the origin of emotion. This function is related with perspective taking. Mentalizing other emotion require recognizing of difference about self and other (Fonagy et al.,1997). Self recognition and self/other differentiation is a fundamental aspect of social interaction and emotional and cognitive experience ( Brass et al. 2009). The neural process involved in self/other discrimination at the sensorimotor level is involved, in part, in cognitive level (Giardina et al., 2011) and in emotional level , for example in the emotional incongruence between two subject. Many studies investigating the neural correlates of self-recognition and self/other differentiation focused on temporo-parietal junction (TPJ). This area extends from superior temporal sulcus to the inferior parietal lobe. Previous studies show the role of this brain area in different cognitive function. Corbetta and Shulmann (2002) reported the activation of TPJ on a exogenous attention task when the stimulus is not awaited on a field of view. This shows the role of this brain area in a incongruence state between self and the environment. Another important function of TPJ is the self body location. TPJ is directly connected with Extrastriate body area (EBA) which responds selectively to human body part. a disintegration between somatosensory (proprioceptive and tactile) and visual signals combined with an additional visuo-vestibular disintegration (Blanke et al., 2004; Lopez et al.,2008). The right TPJ is more active during the attribution of actions to another agent than during first-person motor imagination and imitation (Costa et al., 2008; Decety et al., 2002; Ruby et al.,2004).When another subject imitates our actions by translating his/her bodily perspective to ours, right TPJ activation is reported; on the other hand, if we translate our bodily perspective to that of other people this activation is not shown (Ruby et al.,2004). However, in such an early processing stage, attribution of the observed behaviour to the self might only occur if the observed behaviour is congruent to the planned behaviour, whereas observing an incongruent movement leads to an attribution of the observed behaviour to another person (Brass, 2009). TPJ is involved also on higher level cognitive function as ToM and perspective taking. ( Saxe, Wexler; 2005). This functions allow us to create a theory about other state of mind taking other perspective. Theory of mind may be defined as the ability to put oneself into someone else’s shoes, imagine their thoughts and feelings (Baron-Cohen 2009). ToM, also known as mentalization , enables one to extract and understand the goals of others by drawing on the capacity to understand the other’s thoughts, intentions, emotions, and beliefs and predict their behavior (Amodio and Frith 2006). In particular, inhibition of right TPJ through TMS, results a social neglet that refers to lack of consideration of the real intention of other and to attributions of hostile intentionality to their behaviour (Giardina, Oliveri; 2011). The attribution of hostile intentionality to the behaviour of others is a complex process involving visuo-spatial perspective taking, theory of mind, intention understanding and expression of emotions. This different finding demonstrates that TPJ is implicated in different levels of experience, sensorimotor, cognitive and affective. The aim of the present study is that application of rTMS on the right TPJ, should result in a interference of emotional recognition in another face in a situation of emotional incongruence between self and other. In particular we assume that inhibition of right TPJ leads a quickly emotional recognition in another face when this is incongruent with own emotion than control subjects. We hypothesize that in baseline session (before rTMS) there is a RT significant different between congruent and incongruent stimuli, while after rTMS this difference will be cancelled. In a experimental condition, information about other expression would be elaborated as if they were own because inhibition of TPJ does not allow elaboration of both point of view. Subjects with mirror-touch synesthesia show higher level of emotional empathy than control subjects (Banissy and Ward, 2007). In particular it was demonstrate that subject with mirror-touch synesthesia have reduced matter grey within the right TPJ ( Holle et al., 2013) suggesting that this brain area is important to put a sensorimotor and emotional boundary between self and other. Empatia: maggiore quando a provare dolore sono i familiari! Una prospettiva evolutiva morale sulla testimonianza oculare dei bambini: è importante lo scopo?